While I do like wearing this little red bag with other red accessories, it's nice to pair it with neutral outfits like the ones below and really let the colour pop. The saddle bag style looks just as good with a dress as it does with jeans. I was in a bit of a rush in the morning trying to get everyone ready for playgroup and hadn't really thought about what I wanted to wear. Decided on this printed dress as it's a quick instant outfit, and it's been a while since I last wore it. Although it is still winter it was a little warmer so I could go without a jacket, which was nice. I enjoyed sitting in the sun at playgroup feeding baby, using his muslin wrap as a feeding cover as I didn't quite think things through and realise this scarf was too small to use for that until the last minute. While this dress actually has a little pink in the print, it blends well and looks like a neutral so the red bag was a fun pop against it. Last worn: taupe skull scarf, printed shirt dress, black ankle boots, Rebecca Minkoff saddle bag. Other ways to wear: taupe skull scarf and a blue shirt, printed dress and purple bag, ankle boots and a maxi skirt, Rebecca Minkoff saddle bag and skinny jeans. Had a busy morning - I optimistically thought I could make an appointment, run errands and go grocery shopping while also making it to the library for rhyme time. Of course we were too late for the library, I misjudged how long it would take to find the special ingredients I was grocery shopping for and I got home with a very cranky baby. It was just one of those days where you can't see all the things you did achieve because you focus on everything that went wrong. After a morning like that it was nice to catch up with my mum in the afternoon and she complimented my top too. It made me smile. I really do like this top, and this was a nice outfit, just not the best day. It definitely turned around in the afternoon though. Last worn: black knit, printed tank, flared jeans, ballet flats, Rebecca Minkoff saddle bag (above). Other ways to wear: black knit and skinny jeans, printed tank and a baby bump, flared jeans and Converse, ballet flats and skinny jeans, Rebecca Minkoff saddle bag and a striped maxi skirt. Linking up with Let It Shine, Shoe & Tell, Hello Monday, Modest Monday. Love the pop of the red on your outfits!! Looks great. Red is such a fun pop colour! Such a cute bag! It's always good to add a pop of color, especially in the colder months! Glad your day got better by the afternoon. I feel like when a day starts off badly it tends to snowball and I end up cranky for way too long! I love both of these looks--that dress in your first look is so pretty, and I love the print of your top in the second. I love both, but my fav has to be the 1st look!! That dress is just perfect!! Don't be too hard to yourself, sometimes things might not go exactly how we want but then you already have so much stress, just take it slow :) Adding red bag for a colour pop gave good result, both of the outfits look absolutely beautiful! That red bag adds a wonderful pop of color to both outfits! I love the bag with both outfits! You're really making me want to get a red cross body bag now ;) That first dress is really pretty, the dainty pattern is super cute. Sorry you had a manic day but I'm glad you were able to catch up with your mum! haha you should get one, I love mine! You're such a cutie, that dress suits you nicely. That dress is so flattering on you - and don't you love that we can just throw on a dress and be fabulous?? I love the flared jeans on you too. I feel like they could be having an extended moment on the fashion scene. That red bag is so adorable, and the perfect pop of colour. Have a lovely weekend, my dear! Very true Kim! Always feels like a day would go better with just a little more time! Great bag! Love the pop of color it gives the outfit. That bag is very versatile indeed and it goes so well with both outfits. I do prefer it with the dress though, actually I love the first look much better than the second. I totally agree! Loving it with neutral colours because it really allows the bag to stand out. I'm in love with the dress in the first picture!!! I am loving the red bag with the neutrals, makes it such a feature. Maybe I should try this too! Sometimes it's perfectly ok to try and make the best of a not-so-perfect day. Grocery shopping always takes ages even when I'm alone ;) Love your saddle bag - those styles are always so flattering and pretty. Gorgeous outfit and photographs dear, you look lovely! Have a wonderful day. 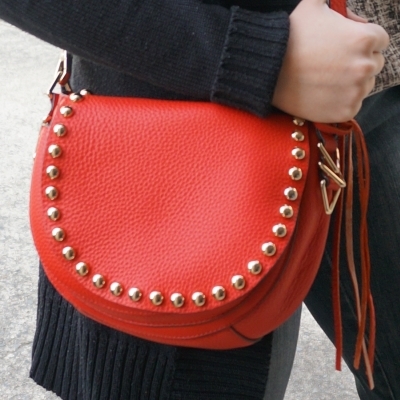 I love this pop of red bag! Nice look! I do agree with you. By wearing more neutral outfits, you make that red bag pop out more. A red bag is always a lovely pop of colour and that one is so lovely...and it works perfectly with both outfits. first outfit: You look phenomenal in that printed dress! you're right, when we don't have time to think, putting on a nice dress is the easier and the best way to get ready. That dress looks so lovely on you. Win win outfit. second outfit: sorry to hear you had a stressful morning and day, but good that by the afternoon of that day things got better...sometimes we just have those days when we want to do too much and we end up stressed...been there, done that. Sweet of your mother to compliment that top..it is really cute and I like how you paired it with those gray pants. Great styling!!! Ha, time is a treacherous thing when kids are involved. Great outfits, I really love the first dress the pattern is cute and I love how you've paired with with simple black leggings and boots! The part of your post that resonated with me was when you said "It was just one of those days where you can't see all the things you did achieve because you focus on everything that went wrong." I've been having one of those weeks, and just having some time out with some friends last night is what I needed to get my mind back on track!! I'm glad you managed to turn your week around! Sometimes we just have a bad day (or days!) and need to get out of a slump! Sometimes we have days like that when we feel everything isn't going our way! It can be so frustrating... Love the dress on you and the red bag is such a nice touch to both outfits. Actually the first thought that came to my mind when I saw your post is how thin you look! I think you lost quiet a lot of your pregnancy weight! haha thanks, it's been quite a few months post-baby so it's all just falling away naturally at its own pace, just like how it got added on! Awesome outfit, I love it especially your beautiful bag, you look gorgeous, thanks for sharing!!! Great outfits! I'm loving the dress, tights and boots combination... looks great. It's hard to focus on the good when a number of things go wrong in a day... Glad your day got better! 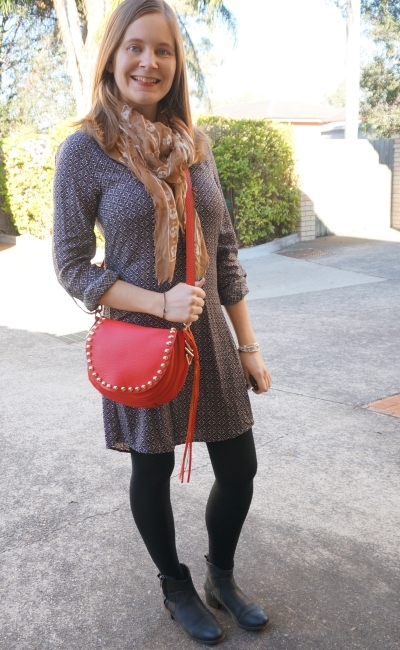 I really like both neutral outfits, and the pretty red bag is the perfect pop of color! I'm glad that things went fine eventually. Sometimes our days just never go as planned. Keep smiling though and great outfit! 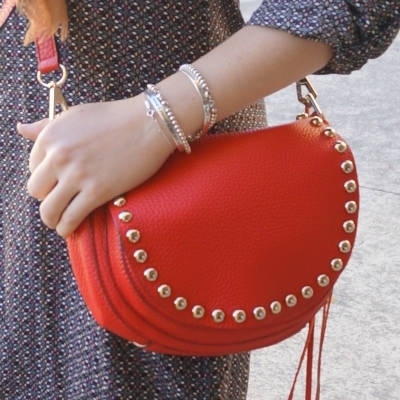 Love this red studded bag! I totally agree it's the perfect pairing with a printed dress for an instantly cute outfit! I love that dress on you!! I am ready for dresses and tights. Sorry you had such a busy morning. Glad you got some time with your mom though! Love that cute dress. Jeanswest often have such nice prints. Glad your rushed day got better. Those ones always throw me for a loop. Loving how you showed two different outfits Mica, you are so gorgeous! I have this one striped bag that stands out and anytime I want to keep the rest of me pretty neutral and laid back, I bust it out. I love how you used the red back in both a dressier look, and more of a laid back one. Proving versatility makes our closets and purchases go far! Yes! And that splurging on accessories can sometimes be justified ;) hehe! Somedays are just too much to handle - luckily yours got better.